Recently, a Hong Kong-based market research firm Counterpoint released a report that reveals that Indian mobile phone marketing is expected to cross the $10 billion mark, leaving behind that of Japan. “The third largest Smartphone market India is on track to reach USD 10 billion in Smartphone revenues for the first time in 2014 and will surpass Japan in terms of the total mobile phone shipments revenue size in last quarter 2014,” Counterpoint Analyst Neil Shah said. The report also revealed that in spite of the fact that Indian customers are quite price-sensitive, they are buying premium iPhone smartphone as the third quarter report of Market Monitor service released by Counterpoint emphasized that how the shipment of premium iPhone smartphone in India has crossed over one million for the first time. “The Cupertino vendor (Apple) crossed 1 million units of cumulative iPhone shipments for the first time in its fiscal year ever (October 13-September 14) for India market. This is a notable feat for Apple as it captured almost half of the high profit premium segment, taking share away from Samsung,” Counterpoint’ Senior Analyst Tarun Pathak said. However, other Smartphone brands are jointly responsible for 35.7% market share in the third quarter according to the report. Talking about the overall mobile handset market, Samsung again spots the top position in Indian market with 15.1% market share closely followed by Micromax with 14.5% share. “In the overall mobile phone market (smartphones and feature phones), it’s a very close race between Samsung and Micromax for the top spot, as Samsung regained the lead from Micromax this quarter after the Indian vendor surpassed the Korean giant in second quarter,” Pathak said. Brands like Motorola, Sony and Lava (excluding Xolo) are shipping their phones in India in a hostile way. 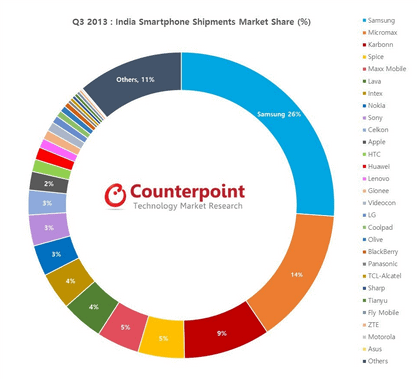 In fact, they have shipped more than one million smartphones in India in a single quarter, which is a record in itself. After selling handsets for just two months, Xiaomi has managed to have a 1.5% share of the Indian Smartphone market and is expected to double its market share sequentially, as revealed by the report. As estimated by Counterpoint, the cumulative Android One shipments will reach a million mark by the end of the year but competition will still be high due to the long tail mobile phone brands offering the same specs even at lower price points and also due to likes of Xiomi.